This new analysis provides evidence that U.S. companies performing best on the priorities of the American public – including worker treatment, fair pay, ethical leadership, and environmental impact – generate significantly greater investment returns and exhibit reduced investment risk than their lower performing counterparts. We’ve found that the top 20% of companies whose business practices most closely aligned with the values of the American public generated 14% higher annualized returns and exhibited 7% lower volatility compared to the bottom 20% of companies analyzed over roughly one year of live trading from Nov. 30, 2016 to Dec. 12, 2017. Importantly, the magnitude of the reduction in risk for relatively just companies is greater than that found by other studies using more traditional metrics of socially-responsible behavior. Furthermore, the top quintile of ranked companies consistently outperformed their peers on return on equity (ROE), by as much as 7% since the release of the rankings. Even after controlling for factors such company size, and valuation (Fama-French factors), the top 20% of companies generated excess return (alpha) of 3.5%, compared to the bottom 20% of companies, which showed negative alpha of 7.1%. In other words, 76% of the noted outperformance can be attributed to alpha, not standard return factors. 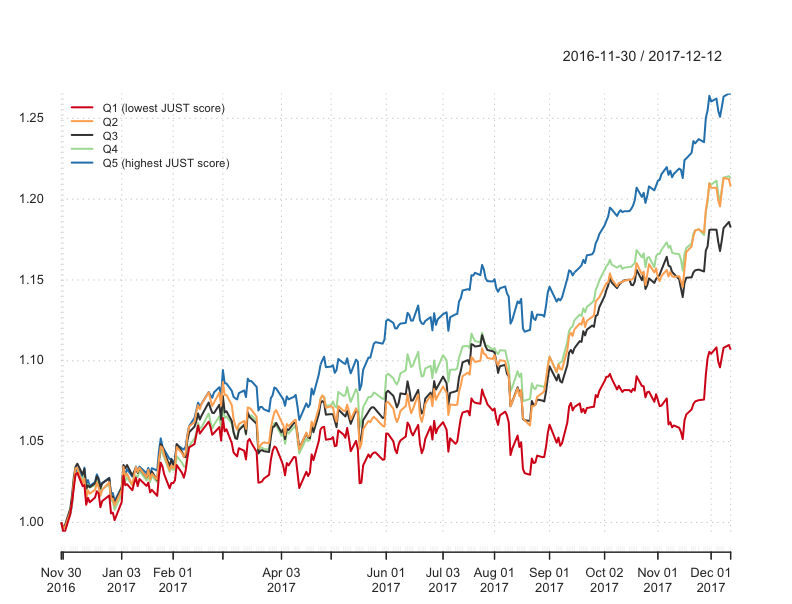 As more investors explore socially responsible investing (SRI) as a strategy, and as the nature of the connection between company financial performance and its “ESG” profile comes under closer scrutiny, this report provides unique, timely, and quantitative insight into the driving forces underpinning this movement. Read the full report here, and more on our findings in Barron’s, Fortune CEO Daily, and Forbes.